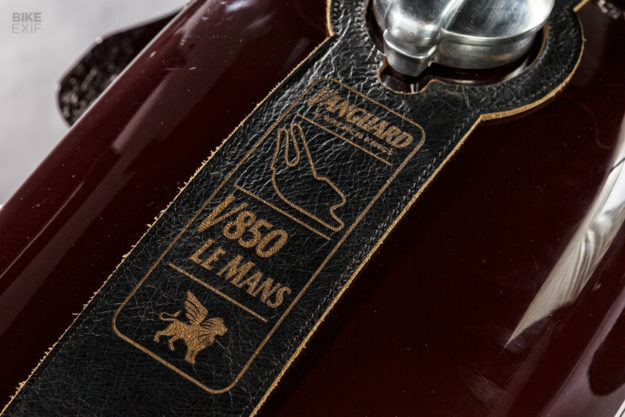 Clothing labels have been leaning on motorcycle iconography to market their goods for decades. 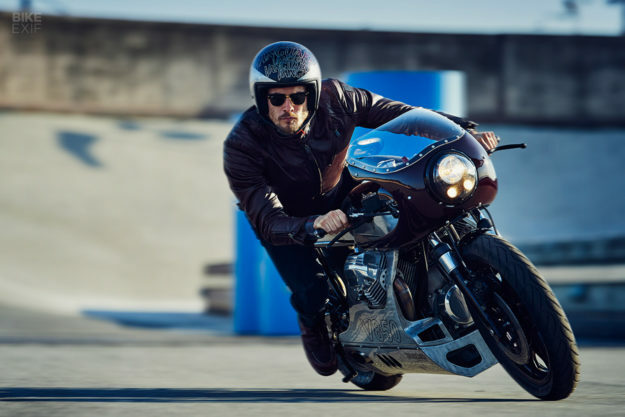 Just look at Belstaff—the entire brand is virtually built on the two-wheeled halo effect. 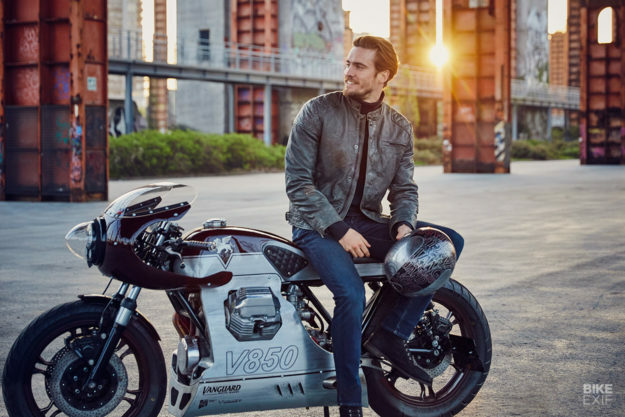 It’s usually as basic as hiring in a cool bike for a shoot, but the Dutch menswear label Vanguard has taken it a massive step further. 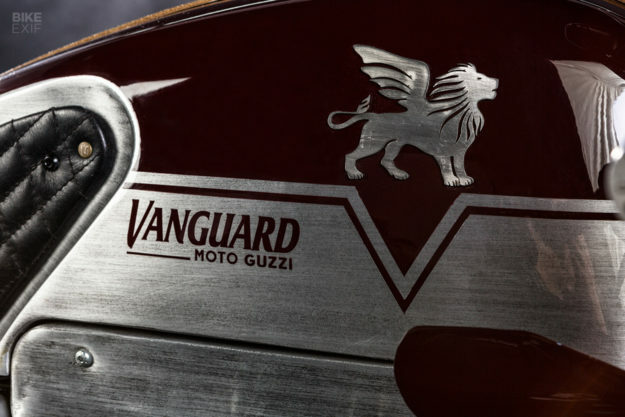 For three years running, Vanguard Clothing has commissioned a custom Moto Guzzi every season to accompany its range. This 1981 Le Mans Mk III is the latest, and it’s an absolute jaw-dropper. Vanguard pulls no punches in its approach. 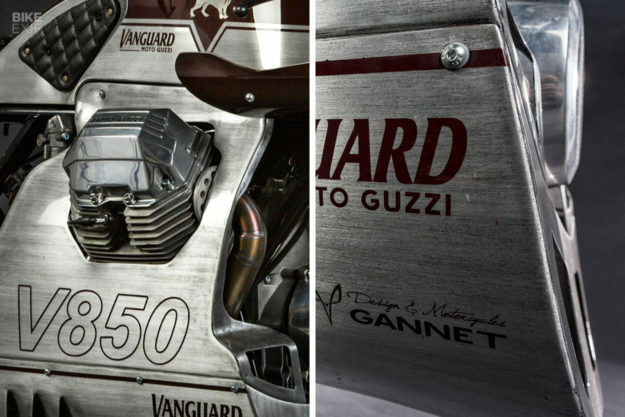 This Guzzi—and the two before it—was penned by the Swiss firm Gannet Design. It helps that Gannet’s founder, the German-born Ulfert Janssen, is a massive petrolhead with a ten-year stint at Renault in his résumé. Now he tackles everything from cars and motorcycles to lifestyle products and luxury goods. 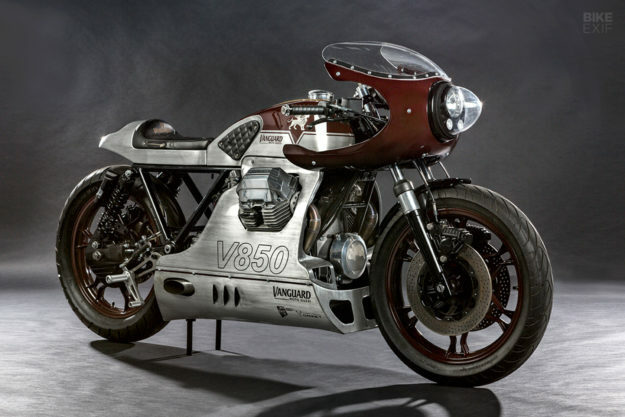 Ulfert wanted to pay homage to the legendary Le Mans series and Moto Guzzi’s racing heritage. The project was dubbed ‘Master of Endurance’—going for an 80s endurance racer with a futuristic vibe. 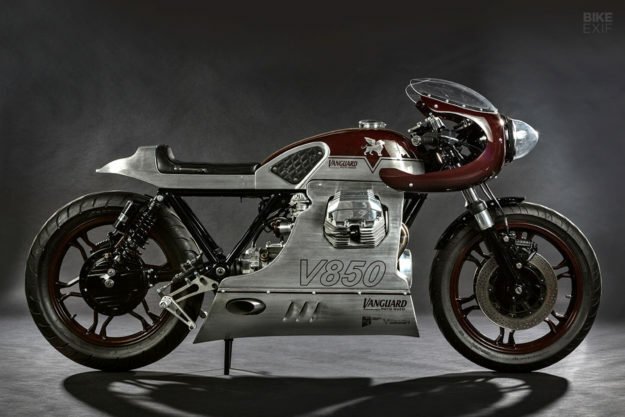 At the same time, Vanguard developed a ‘V850′ capsule collection (named after the Le Mans’ motor), including a pair of moto-inspired jeans. So Ulfert was mindful to include details that would tie the clothing to the bike. The builders commissioned to bring Ulfert’s vision to life were Joost and Take from Wrench Kings in Bilthoven, the Netherlands. And that meant countless hours of manipulating metal to get it spot-on. 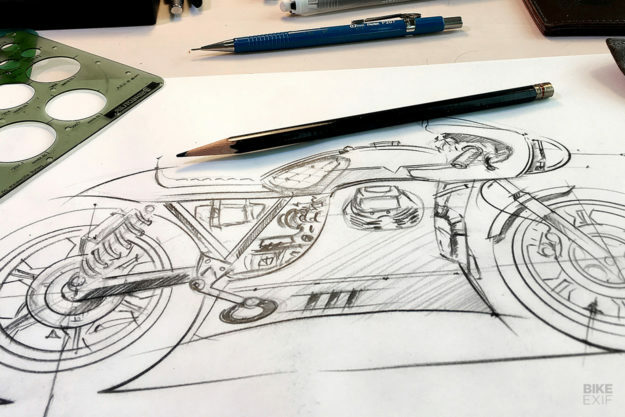 The fuel tank, lower fairing and tail section are all completely bespoke, hand-formed from aluminum with the help of Marcel from The Custom Factory. 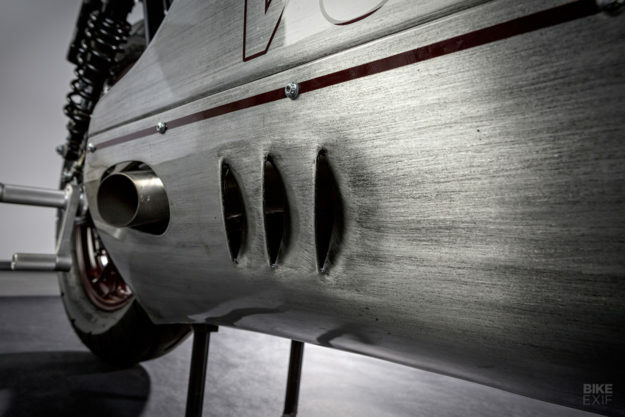 There are a ton of interesting details flowing through this Le Mans—starting with the nose. The bubble fairing itself is an aftermarket part, but the headlight arrangement is pretty unique. Inside the eye-catching bubble is a 7” bucket with modified lights, including two halogen spots. Wrench Kings couldn’t find a bubble cover that fitted the style they wanted—so they made their own. “We made it from a flat layer of acrylic, and tried to mold it in the oven,” they tell us. “It resulted in a plastic blob…so we used plant pots and old headlights to force the shape. At the tail end, Wrench Kings built a recess into the hump, and cut a ‘V’ out of it. 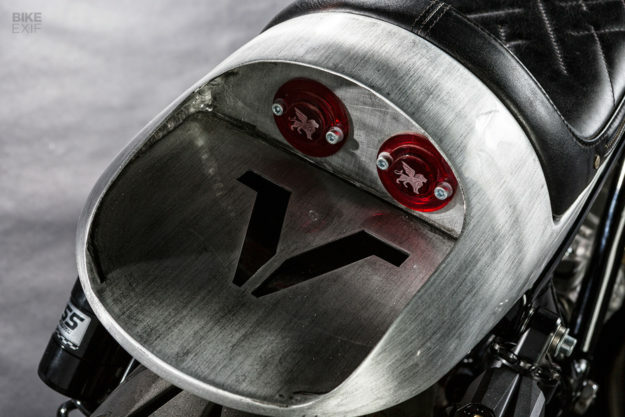 The twin taillights were custom-made—each constructed from five layers of acrylic, with Vanguard’s logo laser-etched in. All the lines and logos are hand-painted, using templates as a guide. Compare the lines on the side of the tank to the ‘V850’ jeans, and you’ll notice that they mimic the stitching. There were at least three failed attempts before the team got it just perfect. 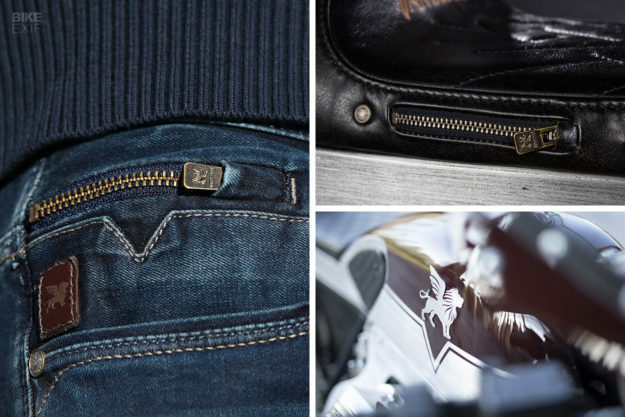 There’s a host of fine leather details throughout the bike too—thanks to Jeroen at Silvermachine. They include the seat, kneepads on the tank, grips, and a strap over the top of the tank. More elements from the jeans tie in here—like the stitching style, rivets and even the zipper on the small stash pocket, on the side of the seat. Under the hood, Wrench Kings edited the frame to accommodate the new tail section. They also de-tabbed it, and fabricated new tabs for the electrical bits under the tank. The wiring’s all new, and the battery’s hiding behind the transmission, hidden by the fairing. Most of the OEM Brembo braking system was kept, but the team installed new master cylinders all around, which has reportedly made a tangible difference. The foot controls are from Tarozzi, but they’re mounted on one-off plates that were laser-cut from stainless steel. But it’s the cockpit that really stands out. 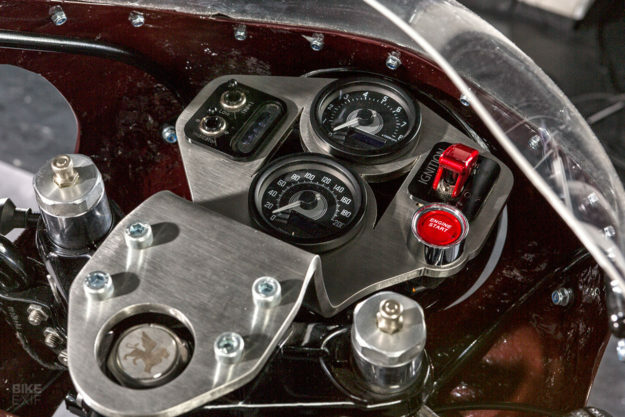 “The cockpit was heavily inspired by old fighter planes,” explains Ulfert, “with gauges and flip switches.” Wrench Kings fabricated a mounting plate, and then kitted it with a pair of dials from Daytona and a host of customized switches. It’s a helluva lot of work to sell some jeans, but we’re glad Vanguard made the effort. This fresh take on the beloved Le Mans has us itching to see what this dream team cooks up next year. For now, the Master of Endurance will be on display in select Vanguard stockists. 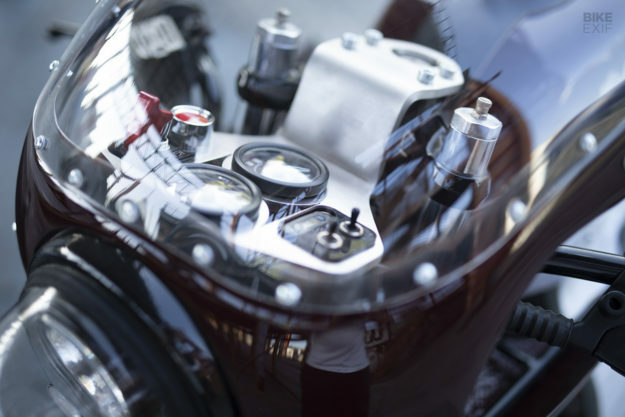 But fear not—it’ll also be taking to the streets for this year’s Distinguished Gentleman’s Ride.